The outside covering of a pie that will serve as a wrapping to keep the ingredients contained within the dessert. 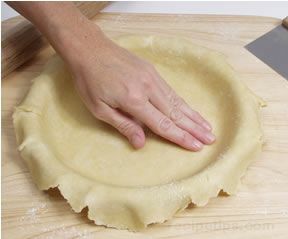 A Pie Crust is made from dough that is prepared with flour, shortening, butter, and water. The Crust may be made from raw ingredients or it can also be purchased in food stores as a prepared crust made by food manufacturers who provide easy to use Pie Crusts for ease of preparation. 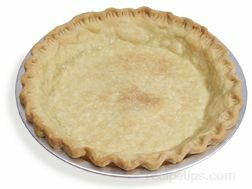 There are several types of Pie Crusts that are most common for use, either single Pie Crusts or double Pie Crusts. A single Crust Pie is a pie that does not have a top Crust. It only has the bottom Crust that lines the pie plate and holds the filling. 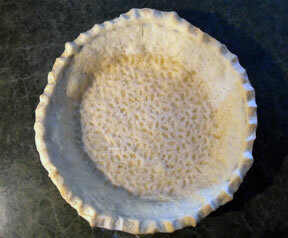 The bottom Crust is placed in the pie plate and the edges are trimmed. The edges are then crimped to provide the Crust with a finished look. Many times a single Crust is baked or partially baked before the filling is added. This prevents the Crust from becoming too soggy when certain fillings are used. Even though a single pie Crust does not have a top Crust, it will generally have some type of topping added either as part of the pie or as it is served. Some of the toppings used are meringue and whipped cream. 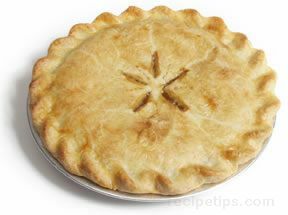 A double Crust is used to make pies having both a bottom and a top Crust. 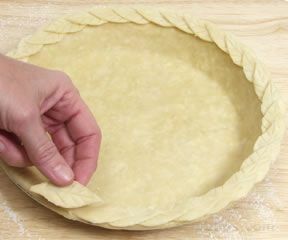 The bottom Crust is prepared first, rolling out the dough or the prepared sheet of Crust and forming it to the shape of the pie dish. 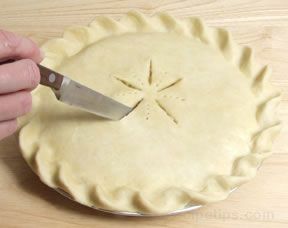 The fruit or creamy ingredients that will be used as a filling are then placed over the bottom Crust. The top is prepared by rolling it out or using a prepared Crust and it is placed over the pie filling. After the Crusts are placed together, the edges of both the top and bottom are trimmed so they can be sealed evenly together as the edges are crimped tightly. 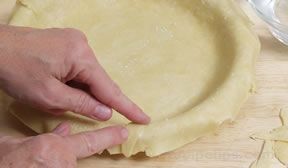 Slits are then made in the top Crust or holes are punctured in the Crust with a fork to enable the steam to be released as a the pie bakes.